Humanhood is an award-winning new dance company founded by Rudi Cole and Júlia Robert Parés. With their work – inspired by physics, human consciousness and Eastern philosophies – they aim to create an immersive and unique experience for the audience. Humanhood’s repertoire includes Without Walls Consortium, a commissioned outdoor duet Orbis, and full length theatre production ZERO – 1st Prize Winner at 30º Certamen Coreográfico de Madrid in 2016. Francesca Marotto asked the founders about their new company and work being shown as part of the Sampled festival coming to Sadler’s Wells in London on 2 & 3 February . The conversation starts by discussing how Humanhood started and how they transitioned from working as freelance dancers to establishing their own company? Rudi Cole (RC): That process happened over a few years, it took us about three years to go through that transition of working as a company to fully committing. Júlia Robert Parés (JRP): It was a very natural process. We were auditioning in Barcelona as dancers and after the audition the director of the festival called ‘Danseu’ came to me and asked if we had any duet we could present at the festival. I said “Yes, of course”, but I didn’t have anything actually. We never made any work together, so I went to Rudi and said: “OK, we have two months to do a duet.” So pushed by other circumstances, we did our first duet. We presented that work at a competition in Madrid and we were among the finalists, so we thought “well, we like doing this and maybe we can keep doing it.” That’s how everything started. In October 2016, we premiered ZERO – our first full length duet – which was funded by the Arts Council. From that point, we started a collaboration with designers, costume designers, and musicians. And since the beginning of 2017, we decided to fully commit to the Humanhood project. What is the main focus of your choreographic research? JRP: Before going into dance, I started a physics degree which I really enjoyed. So when I started creating with Rudi, I introduced him to the topic. We collaborate with Birmingham University (Physics and Astrophysics Department) and on the other side, we really like to travel to Asia and learn about the Eastern mysticism. In our research we try to integrate information from Eastern mysticism and physics. We don’t try to translate, it’s very much about letting this affect us, and then see what happens in the studio organically. What do you aim for when creating dance pieces? And what impact would you like to see from your works? JRP: One thing that we always have in mind when creating is the experience for the audience. Our works are not just a visual entertainment; we feel that they can provide a sort of sensorial experience. When we make our pieces, like we did for ZERO, we think about the nothingness and the void, and the beginning of the universe, but also the fact of being empty inside and the meditation part of it. We always try – also with the collaboration with other artists – to transport the audience into another world, to put them in a kind of higher frequency of themselves, and let them find how they can connect to deeper purposes that are always there, but of which they are not normally aware, because of everyday distractions. It is a bit ambitious. How would you describe your dance vocabulary? RC: We are very conscious of where our history of movement comes from. So, I mean starting from a very young age and dancing very freely, just enjoying movement and dancing to music as young people. And then that kind of spilled into formal training – I trained at the Northern School of Contemporary Dance in Leeds and Júlia trained at the London Contemporary Dance School. That gave us a form, we studied classical ballet and classical Western contemporary techniques. And then when we started Humanhood, we delved into tai chi, and this whole aspect of movements just opened up to us. So at the moment it is really about finding this symbiosis between these two elements. It is not forgetting the training, because that’s embedded in our bodies, but we are trying to find this more organic and fluid essence of movement – a more harmonious movement between the ground into the earth, that connection with the space around you, the flow that is happening externally, but also internally. JRP: There’s something new that came up also, which might not relate to any of these two, but is the movement of the spine. Even in our training and in tai chi the spine is quite static sometimes – we try to find a lot of improvisations and ways, spirals, very circular movements, we think also a lot of 360°. We try to think around us when we create the movement, but also around the whole stage as part of the choreography. You are planning to develop Humanhood Practice, the movement application of the company, tell us about the project? JRP: Humanhood Practice began when we started to create our own work. We really felt that we wanted to have this unique language – which we are still discovering – to find us, because as much as the choreography or the whole composition of the piece is important, we feel that the movement itself says a lot and we wanted to explore that. We spent a lot of time bouncing and improvising and finding all this fluidity of movement. Humanhood Practice is a way of teaching and sharing this with other people. It is a lot about discovering and developing, a continuous process. We feel the classes don’t stop our search. It is also an introspective process for each individual. We spent a lot of time listening to our body, how it moves, and also connecting with the energy of the group. We use this with our company, so it is the foundation of our movement vocabulary. Your first full length piece ZERO (2016), is an immersive sound experience for the audience. Why is experimenting with sound so important in your choreography? RC: We are touching the idea of the audience experience and drawing them into this alternate reality. The initial access point to this is the senses. We use our visual sense so much in everyday life, and the smell as well. We also use the sense of sound often. But the way that we apply this into ZERO is that of a sound experience. We have about 10-8 speakers arranged around the audience that flow on to the stage towards the dancers that are embedded into that same sound space. There is also a section that is called Void where there is no visual stimulus, it’s just sound. The audience is basically in blackout and there is this a soundscape that is watching over the space, where the audience is immersed in. This part is full of contemplation with the audience that allows their visual reference to soften, and to just pick up their ears and senses to this other source of information. You are going to perform an extract of ZERO at the Sadler’s Wells Sampled on 2 & 3 February. How has the re-work process been developed? JRP: We have been working with a new light designer, whose approach is more sensitive in terms of how he uses the light and the lightness of the light. We have him on board and he is doing a completely new light design for the show. We have been working with the same costume designer to re-arrange the top. The style is the same, but we are changing the material and color, and the cut as well. We want to give a little bit more of an Eastern approach to it. The music, that is also a big point of it, we worked with the same sound designer and brought in another composer from outside to work with a string quartet. It is really organic how we put the strings into the piece. We didn’t want to all of a sudden have this classical happening, but we have been working in a way that brings forth the sounds and new information, and when you hear the music it is like every note has a purpose, it’s more like a soundscape than a melody in itself. Could you tell us more about TORUS, Humanhood’s first group piece that will be premiered in spring 2019? I believe it is still a work in progress, can you reveal something about the creation process? JRP: Only a couple of things. The most obvious one is that for the first time we will be creating with other dancers. We are going to start in March this year, so we are going to spend almost a year together, developing them and making them grow into our dance vocabulary. A lot of our work is about synchronicity and the organic symbiosis of two bodies, so we are curious to find out how we can do this with more bodies on stage and also find the interconnection between them. TORUS is like an energy field, the magnetic field of the Earth, a dynamic process. It is one of the basic structures of the Universe. We always start our creations with an image that brings us the frame of what we want to discover and then we just throw ourselves into finding the information from the physics, tai chi, from the books that we read. This is as much we want to say at the moment. We do feel it is more like a process on stage, as much as there is a beginning and an end, but the feeling is that it is a continuous process. You are going to curate Wild Card evening at Sadler’s Wells Lilian Baylis Studio in May. Would you like to reveal something about the program? RC: Without revealing what is actually going to happen – because we want it to be an essence of curiosity for the audience – the idea for Wild Card runs at the back of this, again this audience experience, again this immersive word, we want to call it the “Humanhood Universe”. There is a real harmony between the different elements that are presented. We want it to be a full process, from the beginning all the way to the end. We are working on how to fuse different elements, one into the other, as one space into the other, or one performance into the other. The feeling of being swept away into this other world or universe. And as final question, what is your vision for the company? Any future plans or collaborations? JRP: We have very big ambitions for the company. Now we want to focus mainly on this first group piece (TORUS) and develop it and then see how we work with other dancers. We have many collaborators that we want to work with and set designers, which we haven’t touched yet. We want to have a big company and be able to bring our work to as many people as possible in the UK and around the world. We envision big stages, we aim to inspire many people and ourselves, which is very important. 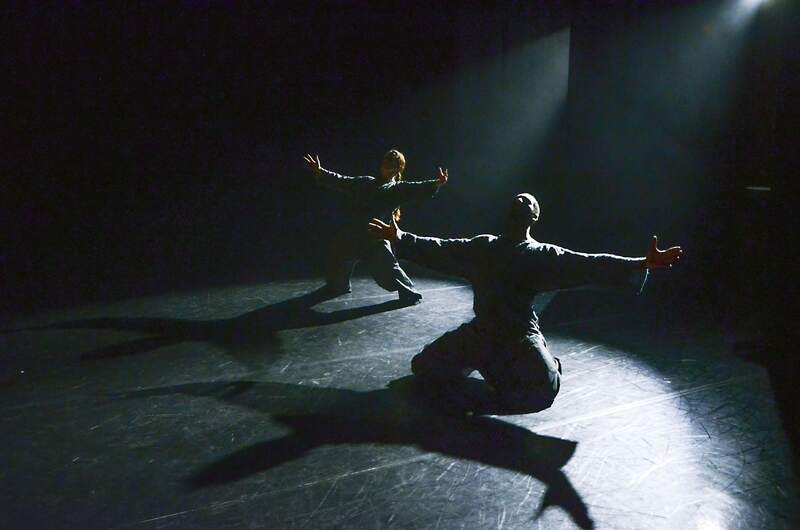 Humanhood will be performing at the Sadler’s Wells Sampled on 2 & 3 February.